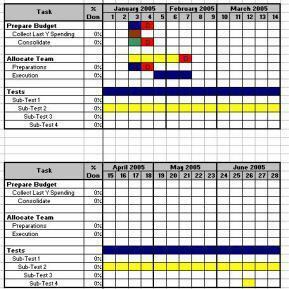 Generate Project Style Calendar Plans/GANTT Charts from a task list and associated details with Custom GANTT Charts for Microsoft® Office Excel®. Includes advanced features like multiple chart types, DEPENDENCIES management & calculation, Multiple-period taskbars, detail filtering, optional fields, extra information, Customization & Localization and Microsoft® Outlook® integration. Runs in Excel, no installation required. FULL REBRANDING option. 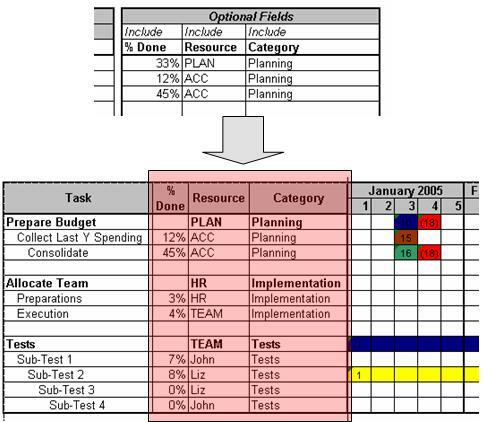 Really EASY project management - If you know Excel, you know this! If you have Microsoft Excel, you can now generate Project style calendar plans (GANTT Charts), just by entering the tasks and associated data like it's name and the starting and end date. Use different colors and select a deadline terminator for each task. Indent each task to its level or sub-level. Based only in EXCEL - No installation or setup required. Just open in Excel and run! 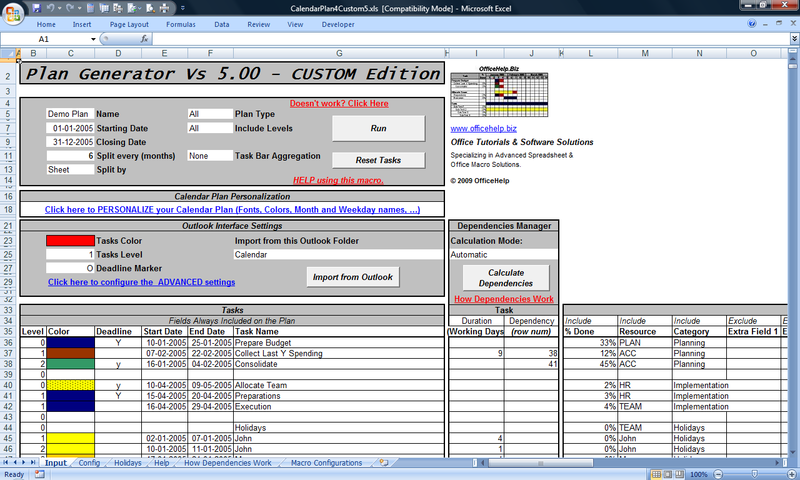 Excel 2007/2010 - Extra Features for latest versions while remaining fully compatible with the previous versions. Really EASY to use - If you know Excel, you know this! Really easy to use, just fill in the values in the Input Cells (or import them from Outlook) and press the "Run" button to create several different styles of Calendar Plans. The system will generate a new workbook with the resulting Calendar (PICs. 1, 2, 3 and 4). This new workbook HAS NO MACROS on it, just the resulting calendar. Change, save and email it as any other regular Microsoft Excel file. PIC. 1 - Daily Calendar Plans have a column for each day in the calendar. PIC. 2 - Weekly Calendar Plans have a column for each week in the calendar. Better for larger periods, when the "big picture" is important. PIC. 3 - Monthly Calendar Plans have a column for each month in the calendar. Better for larger periods (1 year and above). Very good for 1 year calendar plans with an overview of the main tasks. There is no task bars, just a 1 year grid (per year). Better for important but short events like meeting and holiday calendars. Easily manage task Dependencies and Durations. If one tasks changes (delay, etc) the dependent tasks AUTOMATICALLY adjust. Automatically calculate End Dates by defining task duration in Days or Working Days (discounting Weekends and Holidays). Project management ready! To create a dependent task, just enter the row number for the "Master" task (the one on which the task is dependent). Automatic calculation of task dependencies - as you type! * Holidays need to be inserted on the Holidays tab. There is an automatic holiday generator that currently supports the USA. Corporate IT? Consultant? Software Developer? Supply your clients or staff with your own REBRANDED version of our calendar software!!! WARNING: This is not a Source Code Edition. Access to source code is not possible, If you are interested on Source Code, please check the Source Code Edition. After payment at PayPal, you will get to a confirmation page with a link to download a ZIP file containing the macro Microsoft Excel file (CalendarPlan4Custom5.xls). Click on this link and save the file to your own hard drive. You will need to unzip it (extract the Microsoft Excel files from the compressed ZIP file). Once extracted from the ZIP file, just open them with Microsoft Excel every time you want to use it. The DEMO version of other products can be also included for evaluation purposes. There is a README.TXT tet file on the ZIP with a full description of its contents. Don't wait any more! 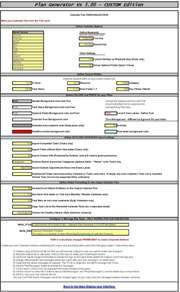 Create YOUR OWN version of the Calendar Plan Generator. 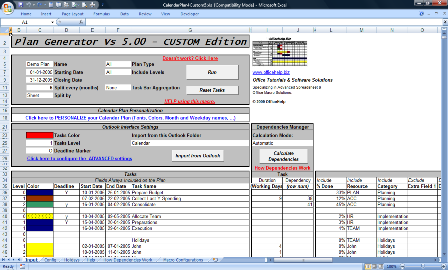 You have full rights to modify our Copyright message, shown after each calendar plan generation, using (and only) the interface provided for it on the CONFIG Sheet of the Calendar Plan Generator CUSTOM Edition. You may distribute the changed version to any existing or future external or internal client by personal relationship. You are strictly forbidden to redistribute, sell or made any version (modified or original) available to the general public, use it to advertise or attract new clients and to make it available on the Internet of any form and under any protocol. Macro can only be supplied to third parties under commercial relationships involving personal contacts. Distribution to internal clients within a corporation is allowed. Create Smaller, Pretier and Easier to Read Charts and Calendars! Taskbars can now cover Multiple, Non-Consecutive periods, as required by many real-world tasks, like meetings, holidays and several other common project tasks. No need for multiple bars to display the many non-consecutive tasks on your project / calendar. Create SMALLER and EASIER TO READ Charts and Calendars. Ideal for holidays, meetings, etc. There are now 4 customization categories and you can customize all aesthetical features of the plan just by supplying samples of YOUR intended format. To supply them samples, just format (using Excel regular tools) the source cell! Background Colors and Fonts for all Plan Cells - Format the Font and Background Color of the sample cell for Headings, Task Names, Optional Fields, Calendar Area, Weekend Days and Deadline Markers. The macro will copy their format to all related plan cells! You can include/exclude up to 10 optional fields that are added as columns between the Task Names and the Calendar Plan (PIC. 9). They are defined by default as % Done, Resource and Category, but can be used for any other purpose. Just change their name! Optional Fields can be defined as Excel column groups (On by default) and Opened / Closed for easier reading & prints. Plans don't all need the same amount of detail (or sub-tasks). 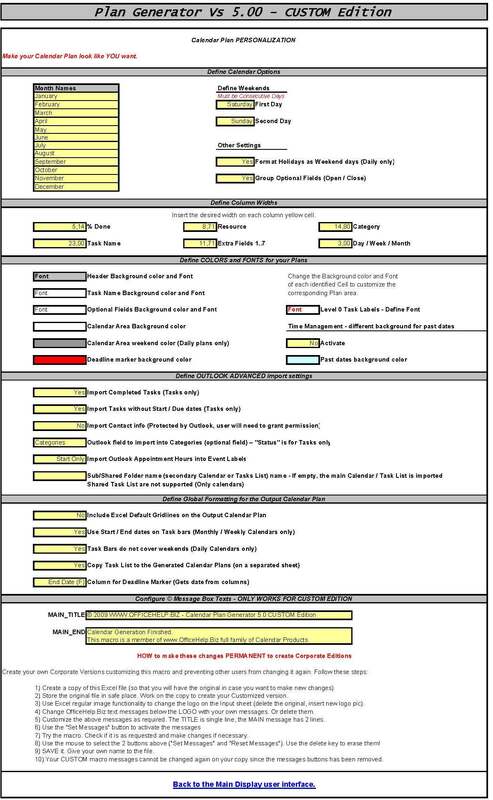 Long-term plans like monthly plans may include only the main tasks (Level 0 or Level 0 and 1) but Short-Term plans like Daily or Weekly may include all sub-tasks (PIC 10). Selection is made on the Include Levels option field near the Run button. 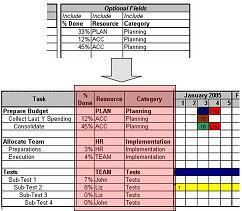 Force calendar plans to be automatically split every N (3, 6, ...) months to produce readable and easy to print plans. Create each split plan on the same sheet or on different workbooks at choice. No additional effort, just make your choices and press run! 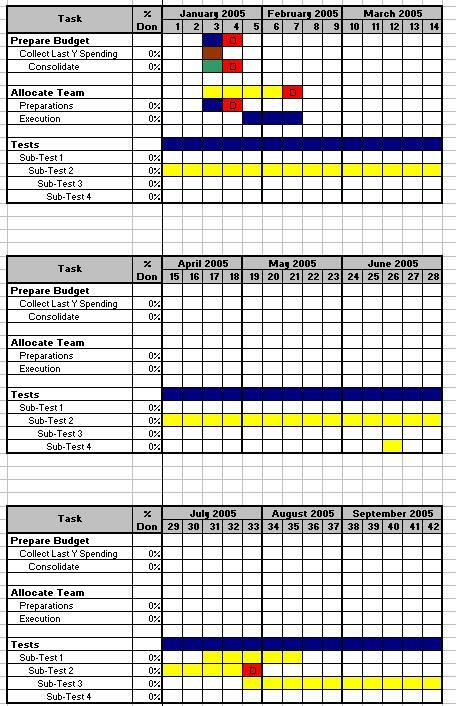 Full year daily calendars without splitting are possible in Excel 2007 & 2010, with more than 256 columns available! Automatically detects of the latest versions while remaining fully compatible with the all Excel versions since Excel 97. 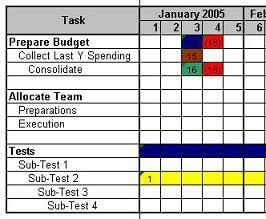 Add the full Task List (including Optional Fields) as a second sheet on the GANTT Chart / Calendar for easier reference. Most Excel users are also Microsoft Outlook users and already have events like Meetings, Holidays and other tasks on Outlook So why write them again for a Calendar Plan? Importing from Outlook is as easy as defining the desired source (Outlook Calendar or Task list) and Color, Deadline Marker and Task Level for the imported tasks. Press the Import from Outlook button and select the first row for the imported tasks (no overwriting of manually entered tasks). Relax and see your tasks being automatically added for you! You may import your main or sub Calendars or Task list and even SHARED CALENDARS just by entering its name on the Advanced settings! Advanced settings are available on the CONFIG sheet. Check the Help Information for details. Easily Print Outlook Calendars or Task lists - Just import them, apply custom formats, create the calendar and print it. Yes. There are two sheets on the Microsoft Excel Workbook (PIC. 16). The first one is the Input sheet, the second is the Help one. There is also an Online Help Page for this product (see bottom of page for all related links). Can the resulting Calendar Plans be customized? Yes, before and after generation. The month names, supplied in English, can be changed to match any other language. The task bars on the calendar can have selected colors and optional deadline terminator. Can I save the Plan Generator with the Plan Data? Can I have several copies? Consultant? Developer? Corporate IT? Make your own BRANDED version!!! CUSTOM Edition (this page product) - No coding, just enter YOUR own messages to replace our own branded messages and learn how to replace the logo, lock your changes (make them permanent) and distribute YOUR own BRANDED version of our macro! No coding! Check the licensing terms. Source Code Edition - Full access to the Macro source code.Add missing features or adjust existing ones to your clients special needs. Supply it as your own product. If you know Excel VBA you should have no problems understanding this macro. Check the licensing terms. Like this product but need a specialized version? Prefer to have the changes professionally applied? Need a completely different Excel product for your own purpose? Contact us here with your request and we will issue a quick estimate. Estimates are free and do not constitute any obligation to purchase the service. Services also available for other Microsoft Office applications like Outlook, Word, Powerpoint,etc.